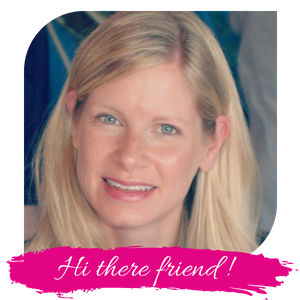 I received the RIR curriculum at no cost and was compensated for my time to review this product. However, I was not required to write a positive review and all opinions are honest and 100% my own. Affiliate links are included in this post. Please read my disclosure policy for more information. As homeschoolers we envision our children reading lots of books and loving them, cherishing them and taking it all in. But how can we make sure that our children are comprehending what they are reading, thinking analytically and expanding their vocabulary while they are reading? Thankfully there are wonderful curriculum materials available like Apologia’s Readers in Residence program. With this all-in-one program your child can study quality children’s literature and learn how to think through what they are reading. I was thrilled for my son to have the opportunity to use this curriculum! While he is an avid reader, he hasn’t been taught the skills to think analytically about what he is reading. And this has been the perfect program for him so far! He is beginning 4th grade this year which is at the beginning of the recommended age range for this program (recommended for 4th through 8th grade). The book is all-in-one so you can open and go. The volume contains both the teaching and the work in one place so everything flows together. It is also very well-organized with the ideas, instruction and expectations thoroughly explained so many children will be able to be fairly independent with this curriculum. There is a suggested daily schedule included and it is based on a 4-day schedule which is perfect for many families! Your child may need extra time to complete some of the work or want more of a challenge and can complete more than suggested, but it is still a useful guideline. Plus there are little boxes your child can check off as they complete the work. 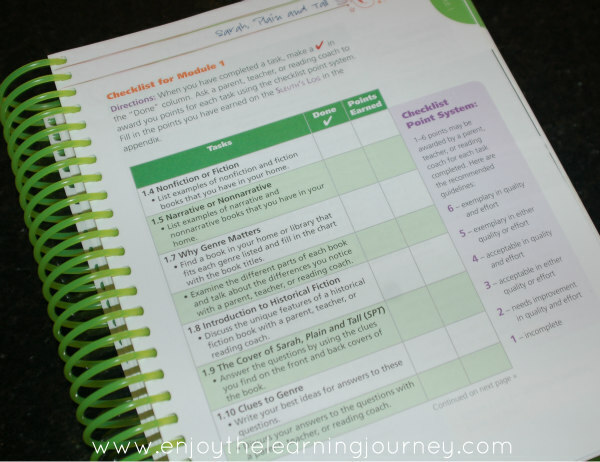 Each module includes a checklist and each large project includes a rubric for the student. I love this! With this information, your child can be 100% certain what they need to complete and how they can earn points for the module or project. The parent awards the points based on effort and/or quality of work and there is a 1-6 point system for this, making it a very easy process for both the child and the parent. The book is easy to look at and easy to read! 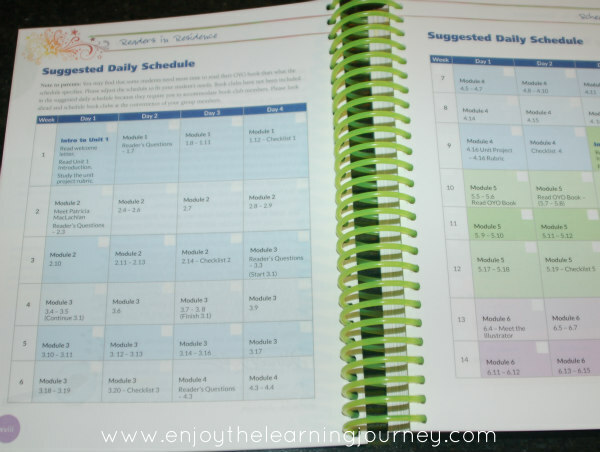 This spiral-bound book has a variety of bright colors and is formatted in a way that makes each page easy to look at and read. There is appropriate color added in, like important words highlighted, that make learning just a little bit easier for kids. Discussion is an important part of the curriculum. There are many opportunities for the child to talk about what they are reading which is so important. Because a book should not only be read, but also talked about and discussed! There are assignments included that give the child the opportunity to talk about what they are reading and also to relate it back to scripture and making comparisons which is so important. Students are encouraged to start a book club and there is information on how to get one started and how to run it. Children will explore three genres while reading quality literature. 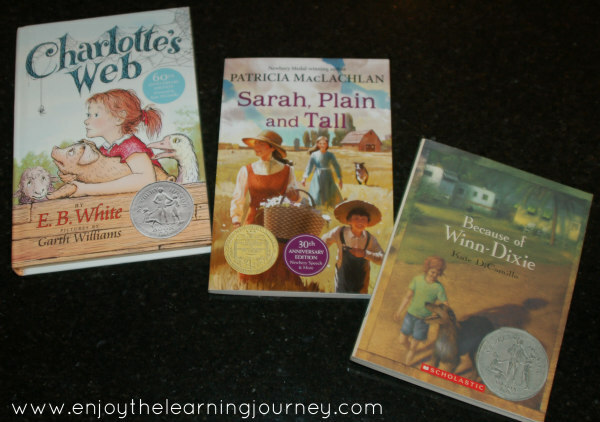 The three genres included are Historical Fiction, Animal Fantasy and Contemporary Realistic Fiction, with students reading Sarah, Plain and Tall, Charlotte’s Web, and Because of Winn-Dixie. In addition, your child will have an opportunity to choose an additional book to read in each genre (with suggestions given). There is an answer key available with examples and answers. Writing assignments can be hard to correct as times so this is one more tool for parents and students. It also provides examples that allow your child to compare what they wrote to the example provided. I found it very helpful to use for reference as I reviewed my son’s work. 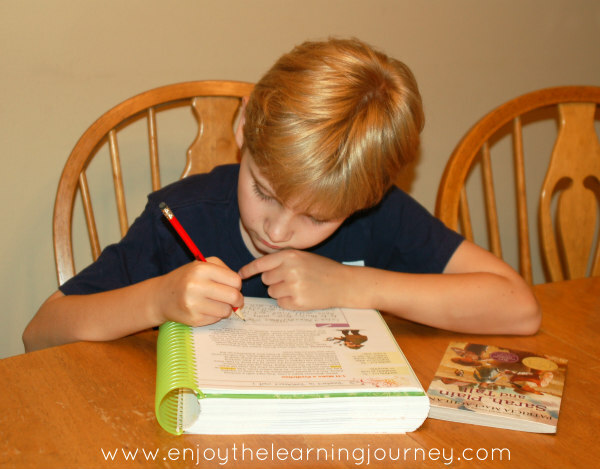 Overall, it is a great choice for our homeschool and my son’s 4th grade language arts curriculum this year! Does it look like something that would work well in your homeschool? And make sure you download this 100+ page sample and FAQs. 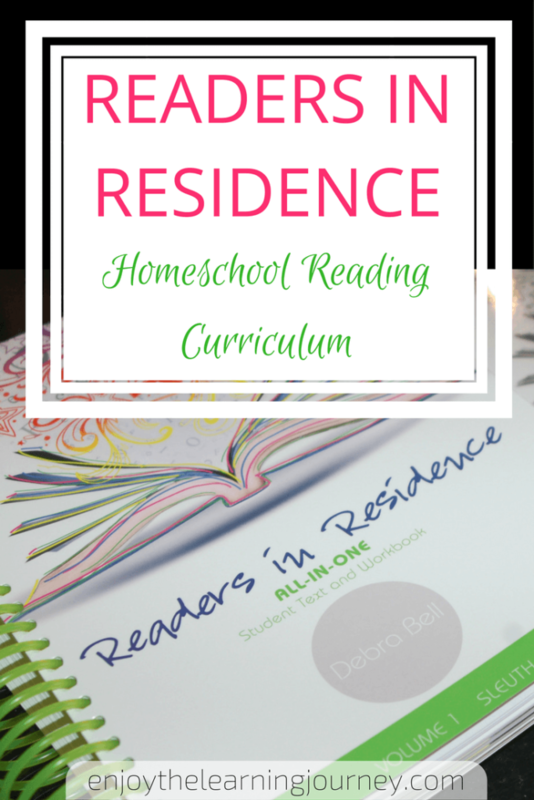 If you are interested in purchasing the Readers in Residence All-In-One Student Text and Workbook you can head over to Apologia.